The St Regis Saadiyat Island Resort, Abu Dhabi, has unveiled the resort’s flagship Royal Suite, the largest hotel suite in the United Arab Emirates. Spanning 2,100 sq m with four bedrooms, the duplex occupies the top two floors of the resort’s west wing and is priced at Dh130,000 ($35,390) per night. The interior design of the Royal Suite was inspired by the sea, white sand, sea shells, ancient sea worn stones and driftwood. Designed by UAE-based Enigma Design, the interior of the Royal Suite features a warm earth-toned palette with shades of sea mist, teal and blue. 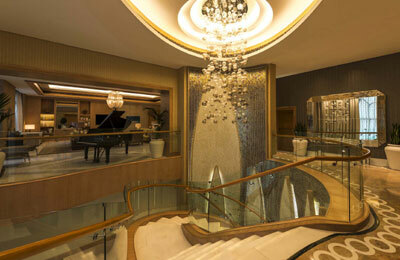 The stunning spiral staircase with a reflective water feature at its base, together with the custom design lighting and curated artwork from around the world, adds to the relaxed grandeur, according to a statement. Upon arrival, guests enter a palatial living room with a Steinway grand piano before stepping into the regal 12-seater dining room, which offers exquisite culinary experiences complemented by the signature St. Regis Butler Service. Also located on the upper level of the Royal Suite are three individual bedrooms, a private study, a mini-cinema and a games room outfitted with a billiard table. Guests may enjoy uninterrupted ocean views while lounging in the spacious terrace with bar or dining by the outdoor swimming pool.